After bidding goodbye to Buenos Aires, our program sent us off to Peru! We had one week split between two cities: Lima and Cusco. We spent our first day in Lima exploring the downtown area and visiting a pre-Columbian artifact museum, Museo Larco. Here we saw ancient pottery, sacrificial tools, and gold and silver accessories that were worn by nobles. We also visited Basílica y Convento de San Francisco, a cathedral that contains a labyrinth of catacombs beneath its surface. On our second day in Lima we traveled to a local university, Universidad Peruana de Ciencias Aplicadas, to exchange country report presentations with Peruvian students. We had prepared presentations on the economy and stocks of other Latin American countries in our Emerging Economies class of Buenos Aires, so this was this information that we shared. We also learned about the informal sector that accounts for a large part of Peru’s economy. After the lecture, we visited an informal market site. Something that surprised me the most about Lima was the amount of traffic: a 6-mile bus ride took us over an hour the first night. Since we were only in Lima for two days, I felt like the traffic took away from the city as it prevented us from making the most of our time there. The next day we took off for Cusco! Here we visited a wool business that taught us how they produced llama and alpaca wool, the proper way to clean it and all the different natural ingredients that they used to dye the wool, all concluded with a chance to shop their products, of course. It was fascinating to see how things such as blue corn and small bugs could be used as dye! 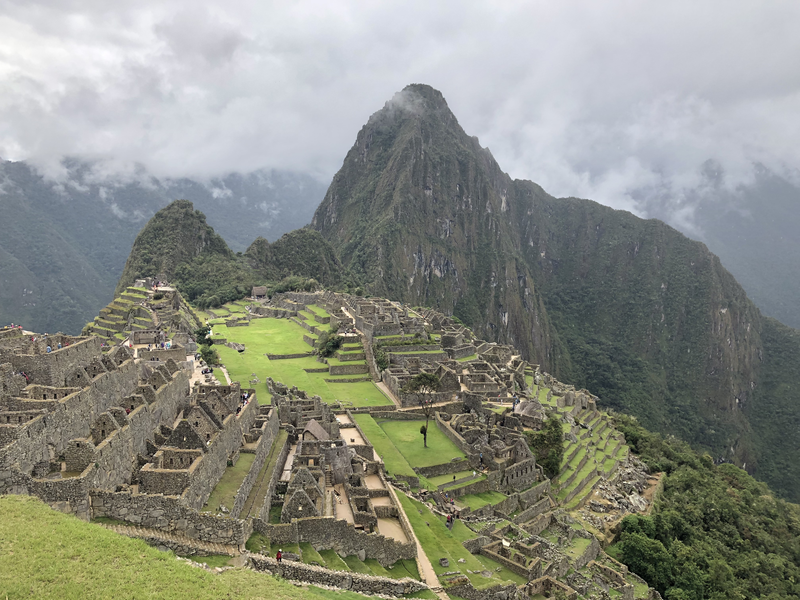 The rest of the trip was composed of visiting various Incan sites, including Ollantaytambo, Machu Picchu (as many know, this is one of the seven wonders of the world), and Saksaywaman. While the original Incas may not be on this earth today their legacy in South America is still evident. It was so incredible to learn about the Incan way of life and get to see first hand their constructions. From their architectural talent used to construct buildings that could withstand powerful earthquakes to their attention to astronomy, the Incas were such a powerful population and it was so humbling to visit Incan ruins and imagine their way of life. Our last day (after a long, long bus ride) we visited a farm run by a Michigan man who moved to Peru to start a career in sustainable agriculture. He is currently helping community farmers maintain their own sustainable practices. Our week in Peru was an exhausting, but rewarding, experience. It was refreshing to be exposed to native cultures, as Buenos Aires had such a heavy European influence that I never felt too outside of my comfort zone. Peru also gave me a taste of what standing out felt like, a preparation of what was to come in Santiago. In Buenos Aires, I felt like I could blend in with the locals when out in public, as most of them were European. But in Peru, blonde hair and blue eyes was not a common trait of the locals. Now onto Santiago for the second half of the program!